On August 20, 1794, an American army commanded by General Anthony Wayne defeated an America Indian force led by Blue Jacket of the Shawnee at the Battle of Fallen Timbers. With this victory, American Indians living in the western portion of modern-day Ohio knew that they had to sue for peace. In January 1795, representatives from the various tribes met with Wayne at Fort Greene Ville. The Anglo-American settlers and American Indians spent the next eight months negotiating a treaty. It became known as the Treaty of Greenville. 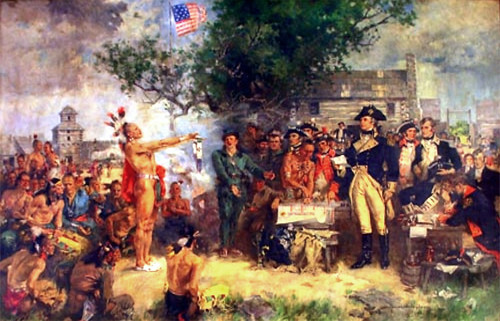 On August 3, 1795, leaders of the Wyandot, Delaware, Shawnee, Ottawa, Miami, Eel River, Wea, Chippewa, Potawatomi, Kickapoo, Piankashaw, and Kaskaskia nations formally signed the treaty. The American Indians who became signatories agreed to relinquish all claims to land south and east of a boundary that began roughly at the mouth of the Cuyahoga River. It ran southward to Fort Laurens and then turned westward to Fort Loramie and Fort Recovery. It then turned southward to the Ohio River. The Indians, however, could still hunt on the land that they ceded. The whites agreed to relinquish their claims to land north and west of the line, although the American Indians permitted the Americans to establish several trading posts in their territory. The United States also provided the Indians with $20,000 worth of goods for signing the treaty. The American government also agreed to give Ohio’s American Indian signatories $9,500 every year in goods. The American Indians were to decide how the goods would be divided among them. Many American Indians refused to honor the agreement. White settlers continued to move onto the contested land. Violence continued between these two peoples. American Indian leaders like Tecumseh and the Prophet would emerge in the early 1800s to carry on the American Indian struggle to regain their lost land is signed. The world’s first themed amusement park, Santa Claus Land, opens in Santa Claus, Indiana, USA. Jesse Owens wins the 100 meter race at the Berlin Olympics. Jesse Owens wins the 100 meter sprint at the Berlin Olympics. The world’s first themed amusement park, opens in Santa Claus, Indiana, US. Germany declares war against France early on in World War 1.